This past Sunday, we unveiled what this little tree is all about in our church foyer! This interactive faith based project, for our St. Mary’s faith based family, will give ALL an opportunity to share what coming to Mass at our parish means to them. “We have something so very special at this parish, and it’s faith, a deep faith. It’s time to share with others inside and outside of our parish, why this faith community is so very special and it’s centered around our Mass. ” commented Father Bob Zilliox. 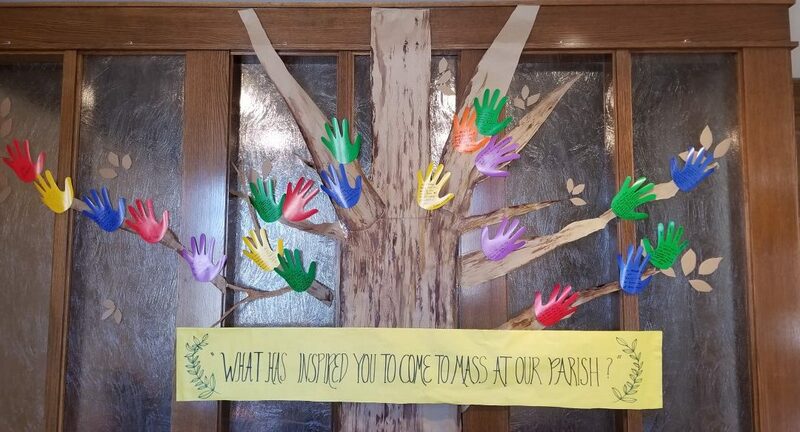 Over the next few weeks the hands will be multiplying on the tree, as we invite our ministries to answer this special question. We invite you to stop by and start reading! On Sunday, April 7th, we will have over 600 hands in the church foyer ready for our entire St. Mary’s Faith Family to complete our tree! Our Family Faith Tree will be up for all to enjoy throughout the Easter Season in celebration of our faith, our Church, and Our Lord’s Rising!